Today’s work of art is by a Scottish painter, Sir James Guthrie, who was a founder member of the “Glasgow Boys”. The Glasgow Boys identified themselves as young artists by claiming vociferously to be anti-establishment rejecting the older generation of artists, whom they called “Glue-Pots”. This group of young artists formed in the 1880’s and were extremely popular between the 1890’s and 1910. The Glasgow Boys consisted of several men, most of whom were trained in, or had strong ties to the city of Glasgow. However, although enjoying being looked upon as being one of this rebellious group of artists, Guthrie exhibited his first major picture at the Royal Academy in London and within twenty years of painting, became the president of the Royal Academy which was the pinnacle of the “Establishment”. In 1921 he was knighted. So despite the bravado of their anti-establishment stance in their early days, many of the Glasgow Boys became very rich painting, as one art reviewer put it, “fat gentlemen in civic robes”. 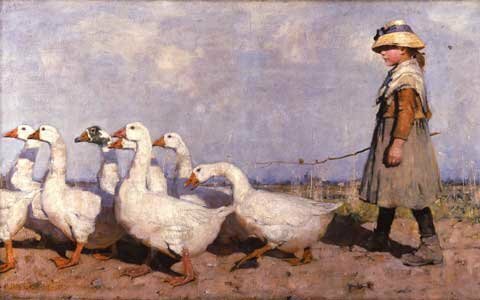 Today’s painting by James Guthrie, aged 23 at the time, is an oil on canvas painting entitled To Pastures New, completed in 1882, and is of a goose girl driving her charges to pastures new. The girl, who is about eight years of age, wearing, what look like, borrowed boots, which appear too large for her, wears a drab dress and a bright straw hat. She, like a giant, marches into the picture shepherding her entrusted animals before her, all of whom fill the canvas with the background landscape taking only a secondary role in the composition. May I know where did you purchase it? I’m not sure if there is a value on a reprint copy of the painting. I have one too and it comes from the colonial art company located Oklahoma. I have one on canvas and it’s in reverse! About the same 30 x 20 ish. Love it. I have also one in reverse lookd very old 27 1/2″ x 17″, does anyone knows a value on theseart items? Where is the original housed? Museum, privaté collector? Value? Last time appraised? Was there more than one copy made? TY! I have one is in reverse, look oil canvas very old, I would like to know if there is any value on it.